This grass pitch cost includes for 2 people and a car, you can bring a caravan, tent, motorhome or an awning and a vehicle. A maximum of 6 people can book this pitch, drinking water is available for you to use and a electrical hookup. At one of the most central points in Southern France it’s no surprise Domaine la Yole has a roaring trade, both now and throughout history. In the Napoleonic era it was at a major crossroads and anyone rolling into town would know from the rows of greening vines that it was a good stop for local vino. In fact, there have been vineyards here since Roman times but it’s only in the last century that the place has truly been transformed, with an impressively vast cellar built, the plantations extended and wine bottled and labelled for proper commercial sales. If you’re looking for sniffing, swilling and sipping, then, you’ve come to the right place and along with tents, chairs and a bottle of sun tan lotion, a wine glass should definitely be top of your packing list. It’s safe to say, though, this isn’t exactly camping among the grapes. The stripey vines cascade around the surroundings but, as the winery has grown, so to has the Domaine la Yole campsite. With over a thousand pitches it’s not a hillside hideaway but there’s no denying a clutch of pleasures it does still hold on to. Wine tasting, touring and cellar exploring are all a delight – the oak of the ginormous barrels lingers in the nostrils as long as the wine itself – and speedy access to the Mediterranean beaches is certainly not to be sniffed at. Then there’s the tree-clad camping pitches themselves. 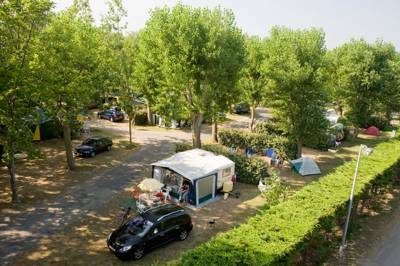 True, there may be a bucket load of campers, but with an even larger number of trees covering the entire site it all has an airy, shaded feel that’s a real pleasure to pitch beneath. You can even pluck for larger ‘comfort’ pitches that have their own individual toilet blocks. Facilities and activities could fill a small book: Swimming pools, bike rentals, canoe rentals for the nearby lake, boat rental on the beach, an adventure park, playgrounds, sports pitches, night markets, snack bars, petting farms... the list goes on. Perhaps it’s a big book they could fill, an Encycolpedia Britanica of camping things to do. Small book, big book, either way, it’s a place that occupies the kids, leaving you time to slope back to wine shop to buy another cheeky bottle. 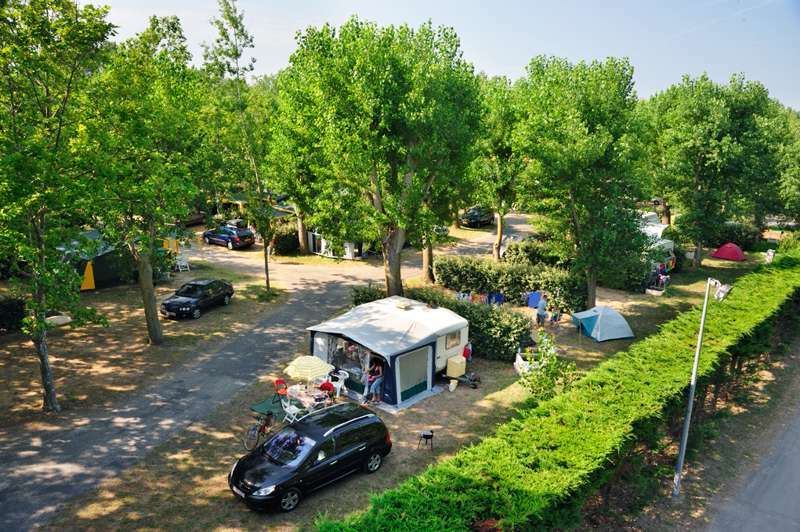 And when it does get too much and you want to slip away, try leaving the coast behind and heading back into the hills of the Parc Naturel du Haut-Languedoc – a vast network of trees and countryside with cooling streams to dabble in. From €21–€56 for 1 tent and 2 persons. See website for further details.